Even after the hottest summer on record, most tomato-growers will be left with a smattering of fruit on their vines that have failed to ripen - and are unlikely to do so in the weakening Autumn sun. But there's no need to throw them on the compost heap; unripened tomatoes can still be put to delicious use. Although they may not have the enticing juiciness of their sweet, cerise sisters, green tomatoes are perfectly edible. Cooked and judiciously seasoned, they can be really quite delectable and, in certain dishes, I'd choose green over red any day. Soup, bread and fritters are all great vehicles for this under-loved ingredient, but my personal, all-time favourite recipe for green tomatoes is a mildly spiced chutney. 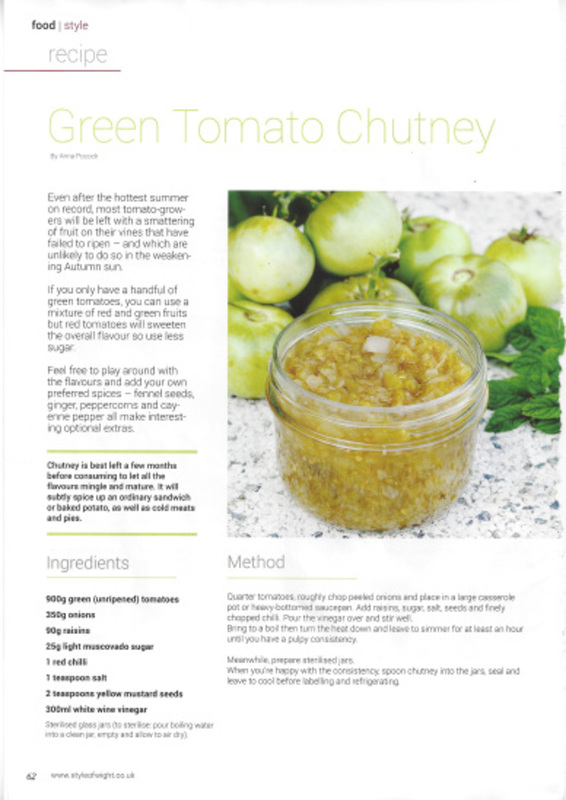 Whether it's the lighter, green-flecked hue that compares so favourably with most sludge-coloured chutneys, or the sharp tang of the unripe tomatoes that wins me over, Green Tomato Chutney is the only one for me. If you only have a handful of green tomatoes, you can use a mixture of red and green fruits, but be aware that the red tomatoes will sweeten the overall flavour, so you may prefer to use less sugar. Once you've tried the basic recipe out and are happy with the proportions of tomatoes to vinegar, play around with the flavours and add your own preferred spices - fennel seeds, ginger, peppercorns and cayenne pepper all make interesting optional extras. You'll also need several sterilised glass jars for this recipe. Quarter the tomatoes and roughly chop the peeled onions. Place them in a large casserole pot or heavy-bottomed saucepan. Add the raisins, sugar, salt, seeds and finely chopped chilli. Pour over the vinegar and give it all a good stir. Bring the mixture to a boil then turn the heat down and leave it all to simmer for at least an hour. If it seems very runny still, let it simmer longer until you have a nice, pulpy consistency. Whilst the chutney is cooking, prepare your sterilised jars. As soon as you're happy that the chutney is cooked, spoon it into the clean jars, seal and leave to cool before labelling and refrigerating. Chutney is best made a few months before consuming, to let all the flavours mingle and mature. It will subtly spice up an ordinary sandwich or baked potato, as well as cold meats and pies. You might also like to try it dolloped into soups, stews and curries - or give some to foodie friends at Christmas, when it will make the perfect accompaniment to a Boxing Day spread.